These capabilities allow important improvements to the Asynchronous Batch Process Pattern solution described here. The lack of Custom Activities support in Online deployment required the usage of a Plugin component to perform the Target Records query and implementing the Action Workflow to each result record. With December 2012 Service Update Custom Activities support for Microsoft Dynamics CRM Online, a Custom Activity can now replace the Plugin component. 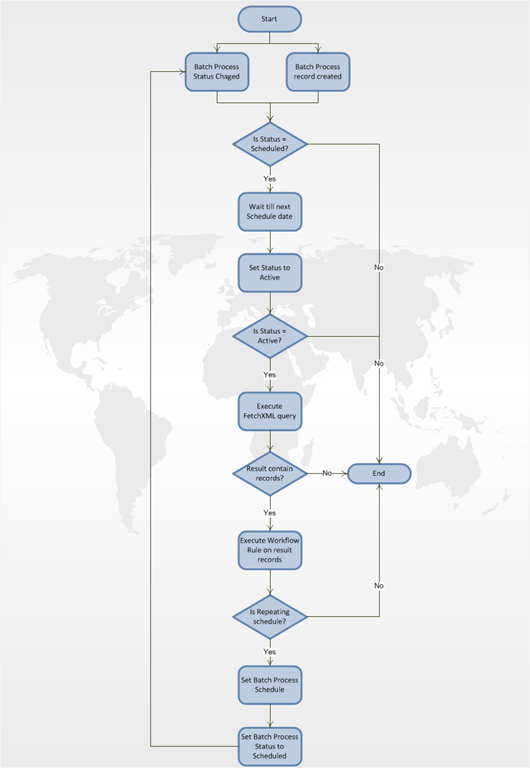 This implementation renders the Asynchronous Batch Process Pattern solution simple and robust. The new ExecuteMultipleRequest class allows sending a bulk of requests to the Organization service in one request, instead of a stream of separate requests. This feature is now used in the Asynchronous Batch Process Pattern solution In order to apply the Action Workflow Rule to multiple Target Records in a single request and to improve the solution’s performance. I will make the new and improved solution available for download soon. Hi, The “Is Status = Active?” condition after the “Set Status to Active” step is always going to be True. No? Thank you for the remark. I can see how this is confusing. The component setting the Status to Active is the Scheduling Workflow, while the Executing component tests the Status and execute only if it equals to Active. I should change the diagram to explain the differene between the components more clearly. Is there a link to the updated solution?